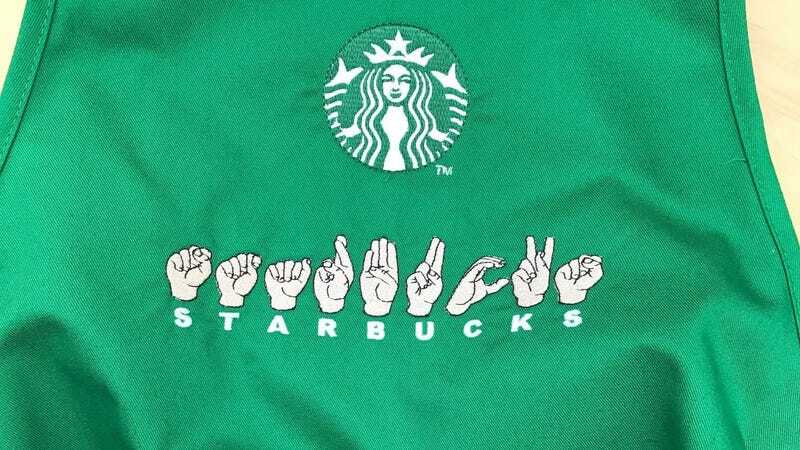 Starbucks announced last week that it will open a first-of-its-kind “signing store” staffed by employees proficient in American Sign Language. The shop will open in October in Washington, D.C., near Gallaudet University, a prominent private university for deaf and hard-of-hearing students. The new location will hire an estimated 20-25 deaf, hard-of-hearing, and hearing employees who can communicate with customers and each other through ASL. The store will feature unique details designed to make it easier for deaf and hard-of-hearing customers to communicate with staff, including aprons for deaf staff embroidered with ASL signs, and pins for hearing employees that indicate “I Sign.” Designers have created an interior for the store that complies with many aspects of DeafSpace, a concept advanced by architect Hansel Bauman, which sets forth design aspects that facilitate visual/signed communication. Some of these elements include glare-free surfaces, clear lines of sight throughout a space, and lighting and seating that minimize eye strain. The store will also feature “communication options” for customers who do not use sign language. The National Association Of The Deaf praised Starbucks’ plans for its first U.S. signing store (one already exists in Kuala Lumpur, Malaysia): “Starbucks has taken an innovative approach to incorporating deaf culture that will increase employment opportunities as well as accessibility for deaf and hard-of-hearing people, while at the same time educating and enlightening society,” the association’s CEO, Howard A. Rosenblum, said in the release announcing Starbucks’ new store. For those new to American Sign Language, below are some useful signs that will help you get caffeinated. And if you’d like to not be a jerk while dining with deaf people, we have some advice for that, too.